My review copy: Review copy provided by the publisher in exchange for an honest review. I could not look away from it. My right hand groped blindly in the needles for the gun I had dropped, but did not find it. Panic built in my throat. The wolf-drake's claws tightened on the stone. I fumbled with my left hand, reaching out farther out, and there! My fingers wrapped around the stock of a gun. I dragged it toward me, raising it as I had seen men do, and the wolf-drake tensed, and as I brought the rifle up it leapt toward me and only as my finger tightened on the trigger did I remember, we had not loaded my gun. No gentleman would want a wife covered in scars from misadventures with dangerous beasts. No gentleman would take on a woman who would be a disgrace to him. No gentleman would marry me, if I kept on this way. The hunt for spouses is an activity on a par with fox-hunting or hawking, though the weapons and dramatis personae differ. A Natural History Of Dragons is a beautifully written book, constructed with remarkable care for details and executed with passion and precision. The novel assumes the style of a memoir and leads the reader on a fascinating journey into the world filled with dragons. Everything - from the phenomenal Victorian/Regency Era atmosphere, coruscating dialogues, unforgettable visuals and - most of all - extraordinary (and perhaps a little bit eccentric) heroine - is to die for! Lady Trent's uncanny narrative voice is what truly made this book for me (well, that and the gorgeously depicted dragons, of course!). She is clever, intelligent, witty, curious and passionate. She's a real lady - polite, cultured and well-rounded - but she can also be quite sharp-tongued if needed. If she really wants something, she will find a way to get it, but at the same time, she is smart enough to pick her battles. She's determined, but not senselessly defiant. Through her eyes, we get to see the mountains of Vystrana in their whole glory. Her descriptions are rich and tangible and they breathe life into every scene, character and place. I'm not sure if I can say that I fell in love with Lady Trent's character - she is not a heroine that you simply "like", but rather one you look up to, admire and respect. A wise old lady who is kind enough to share her amazing adventures with us. And her voice is strikingly authentic! While the title might suggest a book filled with dry facts and boring passages, this story is, in fact, filled with interesting thoughts, reflections and emotionally affecting recollections that keep you captivated all the way through. There are many adventures and mysteries within the pages of this book. As I mentioned before, the story mimics an actual memoir and it certainly reads as one. The writing style, hand-drawn sketches of dragons (which, by the way, are absolutely gorgeous! ), even the realistic Preface written by Lady Trent - it all makes you feel that what you're holding in your hands is, in fact, an authentic memoir of a famous dragon naturalist, magically transported here from a world where dragons are (very) real. The slow pacing of the story will only add to that feeling. Not everyone will love it. If you're allergic to memoir-style books, you will probably not enjoy it very much. If you're looking for epic battles, magic and larger-than-life heroes fighting evil villains - this is not where you'll find all that. But if you appreciate good storytelling, characters that are so realistically drawn you think of them as historical figures, and alternative world settings that are just as believable as they are astonishing, you are in for a treat! I loved this novel. I loved this world. And I loved this journey. I would recommend this book to anyone who loves dragons (the realistic, dangerous kind, not the "How To Train a Dragon"-kind) and intelligent adventure/exploration stories. With vivid settings, breath-taking description of dragons and deliciously evocative prose, it's a feast for imagination. I can hardly wait to read next one of Marie Brennan's phenomenal novels! It sounds like the type of book that I like since I love dragons. :) Thanks for the review! Thank you so much for the time you took to read this, and to post a reivew fore this book. 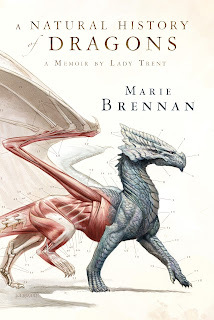 I have had this on my wish list for a while now, and I'm thrilled tosee your comment about reccomending this to dragon lovers, now I know I must have this book. I really enjoyed this book. I loved the writing, it was lyrical, true to the times and heartfelt. I'm happy to see others liking the story too. I was curious to see if I would stand alone or be part of the majority. Glad its shaping up to be others think this story is a great one too. Great review! I haven't read any of Marie Brennan's novels yet but this keeps my hopes up that it's definitely worth it to give it a go. I love Dragons! I think it's really cool that there's a book out like this. I would totally read this over and over. It's really great when authors put so much work in to detailing and providing history for things we know nothing about. Really shows they care about their work. I loved your wonderful review and since I love dragons, I'm sure I'm going to love this book. This sounds like it would be so interesting. I haven't read anything with dragons. Great review. This sounds fabulous. I love this idea of writing about dragons in a Victorian-esque travel diary/biological journal, instead of the standard dragon stories which have fighting and elves and stuff. So cool. And the cover (and doubtless the inner pictures too) is basically perfect. this makes me want to read the book even more! I'm instantly obsessed with this book and simply must have it!! !